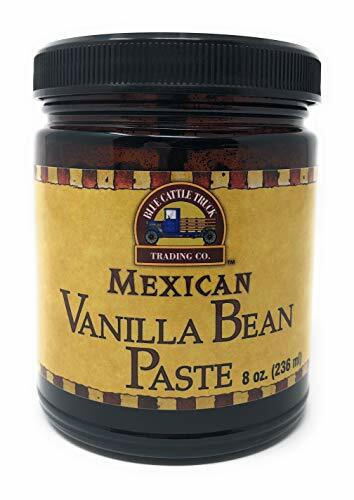 Just one teaspoon of Mexican Vanilla Bean Paste from Blue Cattle Truck provides your recipes with the flavor comparable to a whole vanilla bean. This paste not only gives your recipes a rich and concentrated vanilla flavor, but it has the vanilla "caviar" seeds that add to the appearance and aroma of your dishes. With the thick consistency, you can use this paste to add more delicious Mexican vanilla flavor to batter and sauces without thinning them out. Gluten free, All Natural, No Additives or Preservatives. Gives your recipes a rich and concentrated vanilla flavor. Enjoy the vanilla caviar seeds to add that extra appearance and aroma to your dishes. Use add that delicious vanilla flavor to your favorite batters and sauces without the need to thin it out. Brand: Blue Cattle Truck Trading Co. If you have any questions about this product by Blue Cattle Truck Trading Co., contact us by completing and submitting the form below. If you are looking for a specif part number, please include it with your message.